Italian Cinema Today: #Venezia73 Interview: Director Ambrogio Crespi of the documentary film "Spes Contra Spem, liberi dentro"
#Venezia73 Interview: Director Ambrogio Crespi of the documentary film "Spes Contra Spem, liberi dentro"
In the Special Program selection of the 73rd Venice Film Festival, you will find a documentary film that takes an in-depth look at a life of incarceration from the perspective of the incarcerated. From firsthand testimony to flashback dramatizations to interviews with officials, director Ambrogio Crespi sheds light on a serious contemporary social issue often overlooked. "When you’re alone in your thoughts, the voices in your head become loud. They are paying with their guilt. They have to wait the time of their incarceration. There’s no hope to have hope." In researching, I learned about the Italian chapter of the international organization against the death penalty called "Hands Off Cain" (Nessuno Tocchi Caino). Made up of citizens and members of parliament working side by side since 1993, the organization's goal is to abolish the death penalty in every corner of the globe. 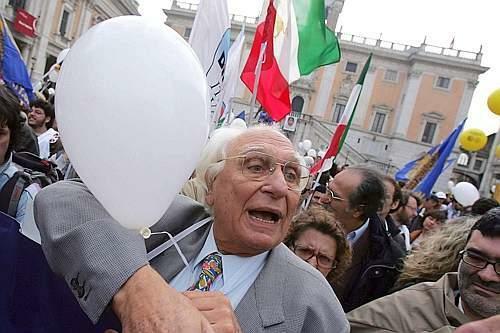 With this film, the director hopes to shed light on the hopes of the movement's chief crusader Marco Pannella, who passed away in May of this year. I spoke with the film's director Ambrogio Crespi about this unique documentary film. He explained his motive for giving this perspective and what he hopes to accomplish. Our interview was done in Italian, so both versions are included. Why did you want to tell this story and give voice to the condemned? It is important that the general public see incarceration from a different point-of-view. Prison should be a place of recovery. Convicted offenders should be rehabilitated and if they decide to embark on the path of change, they should be able to seek help from as many sources as possible without discrimination. We must be their hope. Perché hai voluto raccontare questa storia e dare voce ai condannati? È l'impegno civile che cerca un linguaggio diverso per arrivare a più persone. Il carcere deve essere un luogo di recupero. Il condannato deve essere riabilitato e se decide di intraprendere il cammino del mutamento va aiutato con tutti i mezzi disponibili. Bisogna cogliere la loro speranza ed essere la loro speranza. What went into your research? How did you find the people in your film? The people who participated in this documentary film are men serving life sentences. Therefore, they are not actors. The actors appear in the real life flashbacks. They externalize their experience, their pain, their wounds. They are men who do not seek any pardon, but who have acquired the knowledge and understanding of the evil they caused in the first place, which led them to a life behind bars. These detainees have taken part in the film by the association (against the death penalty) "Hands Off Cain" (Nessuno Tocchi Caino). Other important presences and relevant participants are: the director of the prison, Giacinto Siciliano; the head of D.A.P Santi Consolo, and the prison guards who work directly everyday with the prisoners. Raccontami la vostra ricerca? Per esempio, come avete trovato le persone nel film? Le persone che hanno partecipato a questo docufilm sono uomini condannati all’ergastolo ostativo, vale a dire al “fine pena mai”. Non sono quindi attori, ma protagonisti della loro vita reale. Uomini che esternano il loro vissuto, il loro dolore, le loro ferite. Uomini che non cercano in alcun modo il perdono, ma che hanno acquisito la consapevolezza del male provocato in primis al prossimo e a seguire a loro stessi. Questi detenuti hanno preso parte al film tramite l’associazione “Nessuno Tocchi Caino”. Altre presenze importanti e di rilievo altissimo sono quelle del direttore del carcere di Opera, Giacinto Siciliano; il capo del D.A.P Santi Consolo, e la polizia penitenziaria che quotidianamente lavora in prima persona con il condannato. It was filmed inside the penitentiary of Milan, called the Opera di Milano. E’ stato girato all’interno della casa circondariale di Opera a Milano. In making this film, what moved you the most? The starting point for the film is a conference of the "Spes contra Spem" (Hands Off Cain), which takes place at the penitentiary. The shooting lasted three days and we shot together with Sergio D'Elia (Italian politician, activist and former left-wing terrorist, now a human rights supporter) and Elisabetta Zamparutti (Italian politician affiliated with the Radical Party). I set up a prison cell with three cameras and three lights, creating an atmosphere of spirituality, where inmates were able to externalize the two souls, the white and the black and this was just magnificent. Sergio D'Elia knew how to lead them through this path of liberation. Nel vostro cammino di fare questo film, che cosa ha mosso di più in voi? (spirito l’animo riflessione..) Siete stati coinvolti emotivamente? Questo progetto inizia durante il congresso “Spes contra Spem” di Nessuno Tocchi Caino nel carcere di Opera. Le riprese sono durate 3 giorni ed abbiamo girato insieme a Sergio D’Elia ed Elisabetta Zamparutti. Ho fatto allestire una cella “di appena 4 passi” con tre telecamere e tre luci creando un atmosfera di spiritualità, dove i detenuti sono riusciti ad esternare le due anime, quella bianca e quella nera ed in questo è stato magnifico proprio Sergio D’Elia che ha saputo condurli in questo cammino di liberazione. What is the message you hope to convey? We tried to bring hope from outside the prison walls to these men serving life sentences, aspiring to make it clear to people who watch the movie, that men can change, if they want. I do not want to convince anyone on my own. Instead, I would like to continue with this project and communicate the thought and message of the association "Hands off Cain" and continue the path traced by Marco Pannella. Qual è il messaggio che speri di inviare con questo film? Abbiamo cercato di portare al di fuori delle mura del carcere la speranza di questi uomini ergastolani, aspirando a far capire alle persone che guarderanno il film, che gli uomini possono cambiare, se lo vogliono. Non voglio convincere nessuno, ma vorrei portare avanti, con questo progetto, il pensiero dell’associazione Nessuno Tocchi Caino e continuare il cammino tracciato da Marco Pannella. Do you think this message will be understood well by an audience as diverse and international as Venezia? I am convinced, because we carry a message of hope and legality with this film. We used a narrative key against the Mafia and the testimonials give validation. I hope, as (Giovanni) Falcone said, the film will act as a "big white sheet" upon which we will display the images of our documentary film. The message of the detainees to young people, especially for those young gangsters or homeboys of the neighborhood, can be really helpful through the drama of their stories. For this reason, I hope that this documentary film will reach these kids. Culture is one of the most powerful means to defeat evil. Marco Pannella, who has been an important point of reference in my life, always lives by a phrase "Be hope, rather than have hope". I would like these words to become a starting point to create major changes. Pensi che questo messaggio sarà compreso dal pubblico internazionale di Venezia? Spero che, come diceva Falcone, sia un “grande lenzuolo bianco”. Perfetto per imprimere le immagini del nostro docufilm. Il messaggio dei detenuti verso i giovani, soprattutto per quei ragazzi di periferia o di quartiere, può essere veramente utile attraverso il dramma dei loro racconti. Per questo motivo spero che questo docufilm possa raggiungere questi ragazzi. La cultura è uno dei mezzi più potenti per sconfiggere il male. Marco Pannella, che è stato un punto di riferimento importantissimo nella mia vita, diceva sempre una frase “Essere speranza, piuttosto che avere speranza”; queste parole vorrei che diventassero un punto di partenza per creare dei cambiamenti importanti. Are there any plans for international distribution? I would absolutely like to thank IndexWay (IndexProduction) and Hands Off Cain for having produced "Spes Contra Spem, liberi dentro". Clearly I hope that with the Venice Film Festival, that various possibilities for distribution will arise. I would like to bring this project "outside of the bars". Ci sono piani per la distribuzione o lo streaming internazionale? In assoluto vorrei ringraziare IndexWay (IndexProduction) e Nessuno Tocchi Caino che sono i produttori che hanno permesso di realizzare “Spes Contra Spem, liberi dentro” Chiaramente spero che con il Festival di Venezia si aprano varie possibilità. Vorrei portare "fuori dalle sbarre" questo progetto. We will keep you updated on the date and time of the screening for “Spes Contra Spem, liberi dentro” in Venice. The festival has not yet released this information.